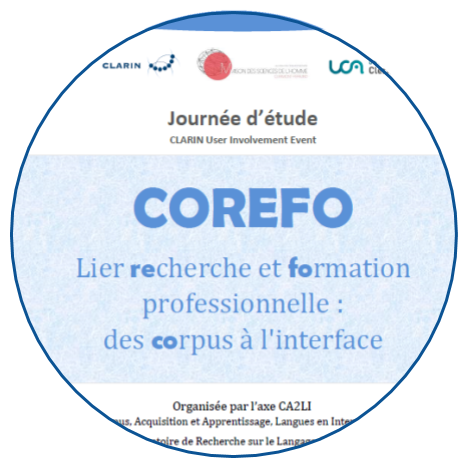 On 16 November 2018, the CA2LI research team of the Laboratoire de Recherche sur le Langage hosted a study day entitled ‘Lier recherche et formation professionnelle : des corpus à l'interface’ (Corpora at the interface between research and vocational training) at the Maison des Sciences de l’Homme, Université Clermont Auvergne (France). 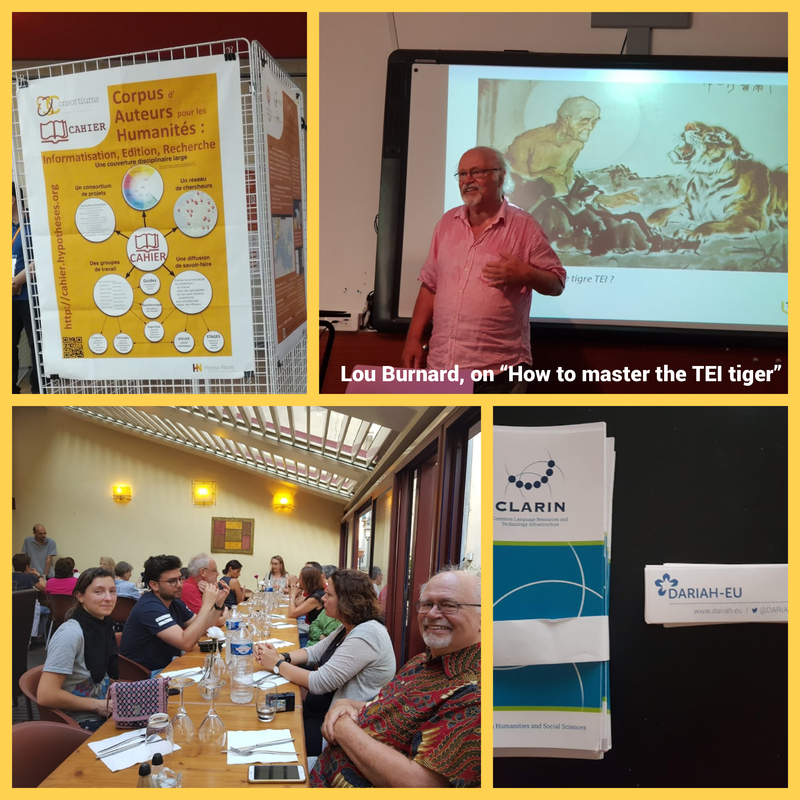 This fourth Oral History & Technology - München workshop, supported by CLARIN took place on 19-21 September 2018. The workshop focussed on the analysis phase of the research process. own blogs as well. 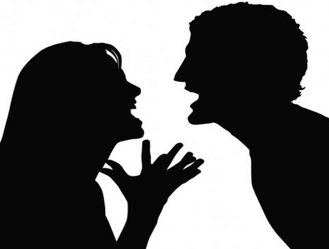 The links to these blogscan be found in this report. ESU2018 took place in Leipzig, Germany from 17 to 27 July 2018. 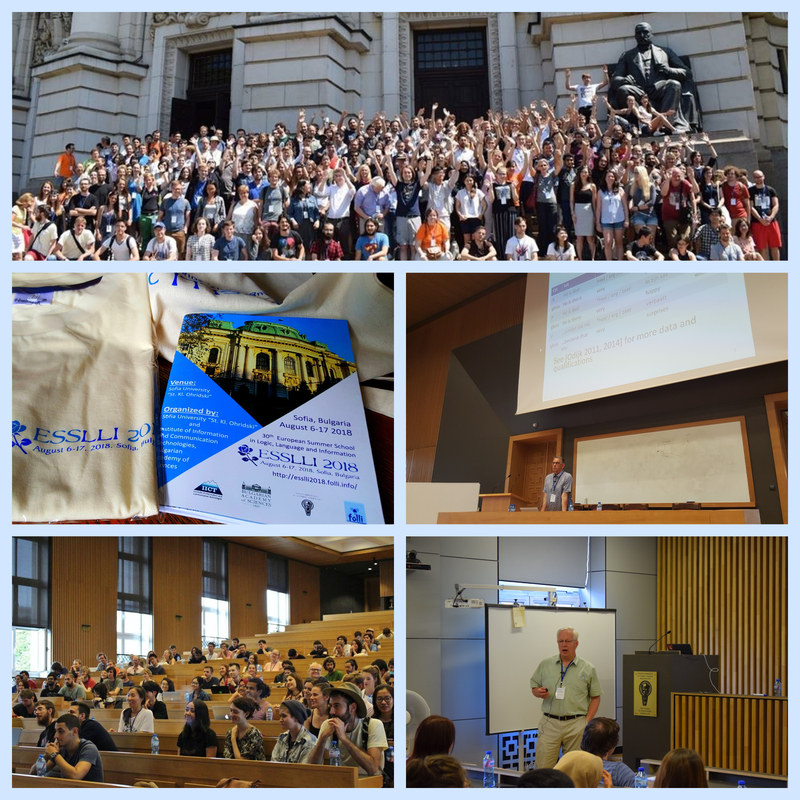 The 30th edition of ESSLLI (European Summer School in Logic, Language and Information) took place from 6 to 17 August 2018 at Sofia University “Saint Kliment Ohridski”, Sofia, Bulgaria.Sofia University “Saint Kliment Ohridski” and the Institute of Information and Communication Technologies, Bulgarian Academy of Sciences (IICT-BAS), jointly hosted ESSLLI 2018. The chair of the local Organization Committee was prof. Petya Osenova (Sofia University and IICT-BAS) and the co-chair was assoc. prof. Kiril Simov (IICT-BAS). On 26-29 June 2018 the Praxiling laboratory at the Paul-Valéry University in Montpellier hosted the CAHIER annual workshop, this year dedicated to the retro-digitisation of historical documents. 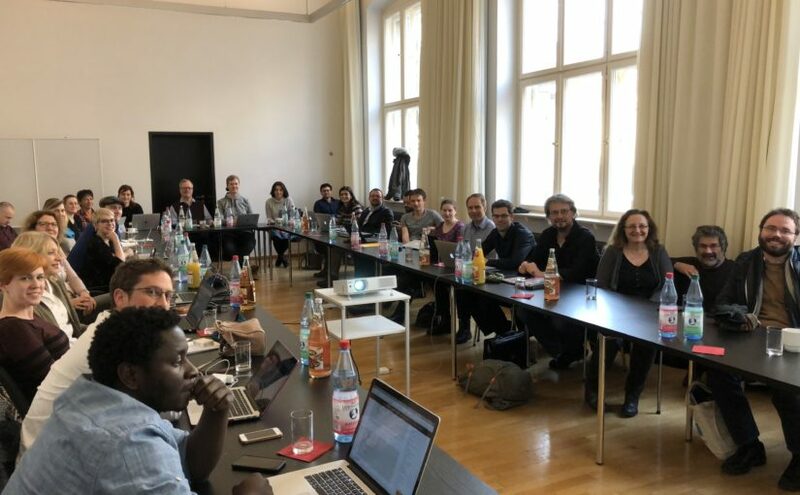 The DH Course Registry Metadatathon was a part of the DARIAH Annual Event 2018 held in Paris, France on Thursday, 24 May, 2018. Workshop "Translation memories, corpora, termbases: Bridges between translation studies and research infrastructures"
CLARIN user involvement workshop “Translation memories, corpora, termbases: Bridges between translation studies and research infrastructures” was hosted by the ACDH of the Austrian Academy of Sciences and the Centre for Translation Studies of the University of Vienna on 8 and 9 February 2018. This masterclass took place at the Berlin-Brandenburg Academy of Sciences in Berlin, Germany between the 4th and 8th of December 2017. It was co-organized by the Centre Marc Bloch, DARIAH-EU, the Berlin-Brandenburg Academy of Sciences (BBAW), Inria (Paris, France) and the Belgrade Center for Digital Humanities (BCDH, Serbia) with the support of the German Ministry of Education and Research (BMBF), CLARIN, DARIAH-DE and the H2020 European project “Humanities at Scale”. On December 6-8, 2017, Swe-Clarin / Språkbanken at the University of Gothenburg hosted a CLARIN workshop on Interoperability of Second Language Resources and Tools. 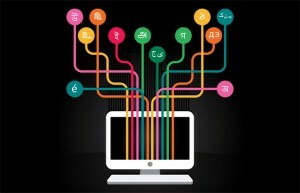 This day-long workshop taught basic natural language processing techniques for large volumes of online text (from websites, blogs, forums, social media, etc.) to researchers in the social sciences and humanities. It was the final day in a three-day conference entitled ‘Digital Youth in East Asia: Theoretical, Methodological, and Technical Issues’, organised by the East Asian Studies research unit at the Université Libre de Bruxelles. 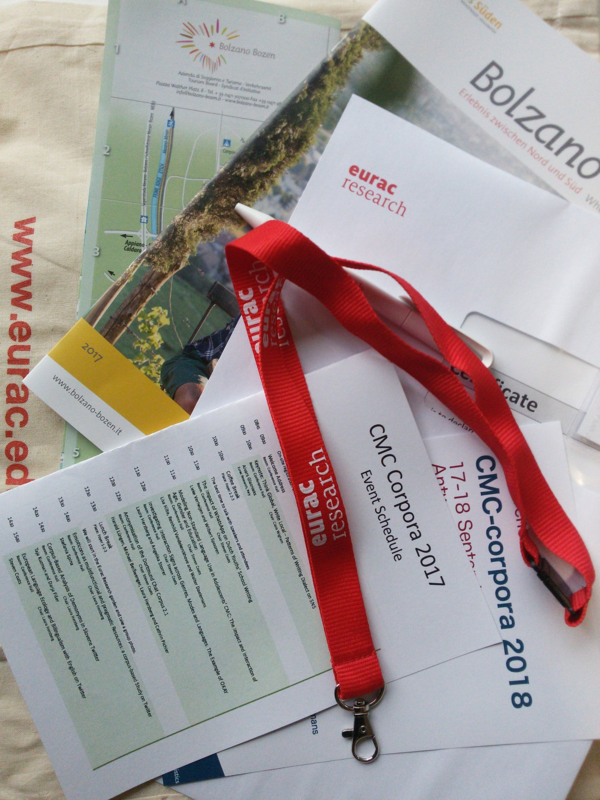 The workshop titled “How to use TEI for the annotation of CMC and social media resources: a practical introduction” was held in association with the 5th Conference on CMC and Social Media Corpora for the Humanities (cmccorpora17) at Eurac Research, Italy on 4 October 2017. 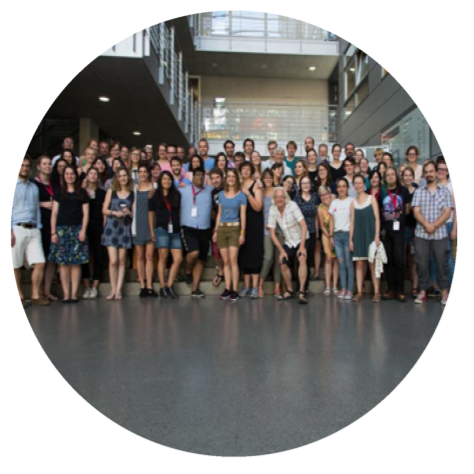 The 3rd edition of the Translation Technologies Summer School, jointly organised by the Department of Translation at the Faculty of Arts, University of Ljubljana, and the Slovenian Language Technologies Society. 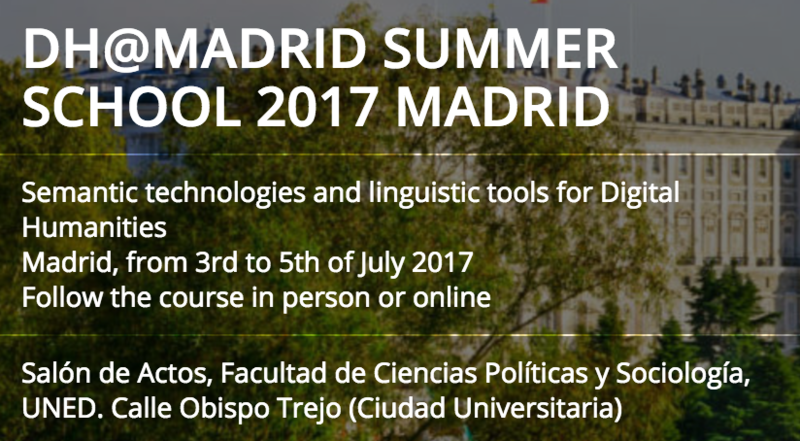 The DH@Madrid Summer School 2017, titled "Semantic Technologies and Linguistic Tools for Digital Humanities" was organized in July 2017 by the Laboratory of Innovation of Digital Humanities of UNED. Organized by an enthusiastic team around Elisabeth Burr, the summer school, which was established at the University of Leipzig, Germany, in 2009, was again co-sponsored by CLARIN – besides receiving funding from Leipzig University, the German Academic Exchange Service (DAAD), and other national and international institutions. 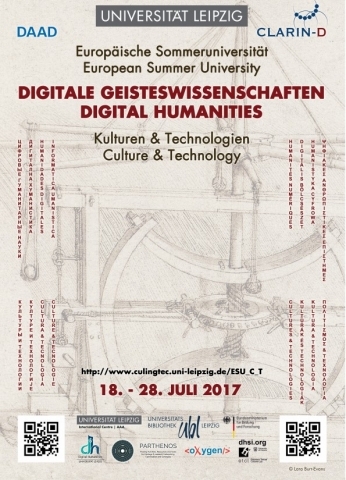 The ESU 2017 took place on 18-28 July 2017.